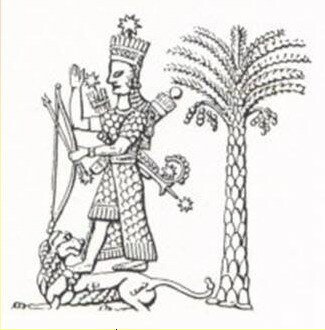 Linguistic note: In Sumerian myths the land of Dilmun (probably the original conception of paradise called by the Hebrews the Garden of Eden) was the place where the sun rises -- thus I surmise dil- may mean east. Description: Warrior aspect of Ishtar as astral Goddess of dawn and the desert; She who opens the portals of heaven in Her supremacy; She who each morning, arrayed in Her armor, drives forth in Her lion-drawn chariot to hunt down animals and people. Agasaya is perhaps an alternate name for Dilbah, see below. Perhaps also called Masat, see below. Originally a title of Inanna. Sources: Monaghan BGH 154; MEM/32-2, 114; NEM.JG/25, 118; Walker WEMS 457. Description: Warrior aspect of Ishtar, the fierce and fearless virgin perfect in courage; Goddess of the daylight sky, [battles of life] and human warfare; She who nerves soldiers in the field and destroys their enemies; She who directs conquered kings through dream-oracles. To Whom are sacred: bow and arrows; scimitar. Perhaps an alternae name for Dilbah, see above. An early Goddess who became merged with Ishtar. In the role of warrior Goddess Ishtar developed into Anat. Sources: Monaghan BGH 5; NEM.JG/24, 87. Linguistic note: a Semitic name for the planet Venus. Title of Ishtar, qv. worked on: August, July 1991.